What about people of other faiths? FYI, among Jews of a certain age, there were many enrolled in an organization called the Workmen’s Circle. (Yiddish: Arbeiter Ring) Among some of the benefits of membership besides burial benefits, was healthcare. My father’s brother used to go to their clinic in Manhattan, and a few times while working in NY, I would see him in small grocery stores that installed salad bars and had tables and chairs for people to sit and eat lunch. This organization probably took its creation from some of the similar type organizations in Germany that formed the basis of the Bismarck health care plan. 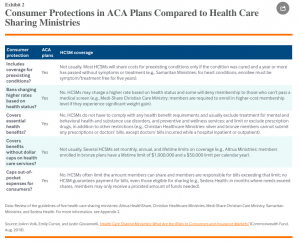 However, that won’t work here, as not all religious groups have such organizations, and have had to rely mostly on the union movement to provide health care to the union’s members and their families. So, sharing ministries, all of whom are Christian, will not work for those who are Catholic, Jewish, Hindu, Muslim, Buddhist, atheist, etc. I was kind of looking forward to “Pence Care” Joe! I’m all in for the Affordable Care Act though…it’s that Obamacare that we need to get rid of! Hey Joe. I was actually looking at signing up for one of these this week because my other plan just expired. Maybe I will do some more research. I know several friends and family in them and they have nothing negative to say but I understand the concern about no guarantees. I did want to ask you… If Obamacare is so great then why are all the Democrats pushing “Medicare for all”? When Obamacare was implemented I remember telling friends and family that the whole reason that was shoved down our throats was because they knew it would fail thus ushering in socialized medicine…which was the plan all along. I do wonder if the plan all along was to get to socialized medicine? As you are aware I am not a fan of big government and them running things (like healthcare) that they know nothing about. But I am also in the boat of healthcare being a privilege and not a right. But that’s another discussion for another day. Anyway thanks for your time. Hello Spencer – good to hear from you as always. I don’t think ACA was in any way intended to be part of some sort of masterplan to move to single payer. 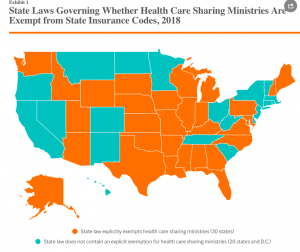 In fact, many efforts were made to make this palatable to Republicans including; no public option, compromises on abortion, minimal penalty for non-enrollees, Cadillac tax, availability of “sharing ministries” and much more. And let’s recall this was originally a Heritage Foundation plan. Second, ACA has been kneecapped by the GOP every way possible and at every opportunity. Blaming the ACA for failing is like blaming the horse for not running after you’ve cut off a leg. ACA was the last gasp effort to keep the current private/public healthcare system functional. The GOP has choked off that last gasp. So, many Democrats are now done bargaining, and are all in on a non-compromise health reform plan. Re government running things, Medicare has far better ratings than almost any private healthplan – and Medicare is government run. As a member of your gullible minion, the description above sounds to me like the desire of some (many?) elected officials. It is regulation-light, probably cheap, and could help reduce social security costs. The step from April Fool’s to some people’s desires may not be significant at times. Let’s hope that good health care policy trumps the April Fool’s flavored alternative.